A detailed discussion of World War One is outside of the scope of this exhibition. Yet one cannot fully appreciate this display without some understanding of the war. A great deal of quality material is readily available on the Internet. The links here are some of the most useful sites on Canada's involvement in the war, and the impact of the war on Canadian politics and culture. 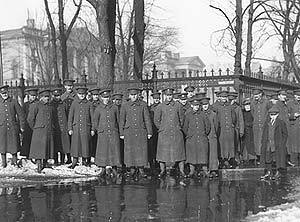 A number of Web sites have information on the progress of the war and Canada's involvement in the war effort. A very good and detailed overview is an exhibition, First World War (1914 - 1918), on the Veterans Affairs Canada Web site. Another good account of Canada's role in the war is an exhibition entitled Canada and the First World War on the Canadian War Museum Web site. A less detailed but still useful exhibition, also called Canada and the First World War, can be found on the site of Library & Archives Canada. Want to know more about the war? Try The World War One Document Archive, a site that enables you to read government and private documents, look at images, and find other information. It's often stated that Canada's nationhood was forged on the battlefields of the First World War. To learn how the war affected Canada's position on the international stage, see 1914-1921: The Crucible of War, a chapter of an on-line history of Canada from the Department of Foreign Affairs and International Trade. For a searchable database of soldiers who served in the Canadian Expeditionary Force in the First World War, visit Soldiers of the First World War: 1914 - 1918 on the Library and Archives Canada's website. Those who died are commemorated in the Canadian Virtual War Memorial on the Veterans Affairs Canada Web site. To read letters written from the battlefield by two brothers, Charles and Walter Gray of Toronto, and to look at photographs of Canadian troops, see The Archives of Ontario Remembers Our Canadian War Heroes. An exhibition based on War Diaries appears on the Library and Archives Canada site. Additional Diaries and Letters can be found on the Veterans Affairs Canada site, which also contains First World War Audio Archives. Find out more about John McRae, the Canadian soldier who wrote the famous poem, "In Flanders Fields". Two very good Web exhibitions cover the subject of Canadian war artists: War Artists From the First World War, an exhibition from of the Archives of Ontario; and Canvas of War from the Canadian War Museum. Brief Biographical Sketches of six Canadian war artists can be found on the Library and Archives Canada Web site. Posters emerged as a major form of propaganda during the war; visit an exhibition of the Archives of Ontario, Canadian Posters from the First World War. Look at recruitment posters aimed at encouraging French Canadians to enlist for war service at Les Purs Canayens, an exhibit of the Canadian War Museum. Patriotic songs became popular during the war: see Music on the Home Front: Canadian Sheet Music of the First World War, an exhibition of Library and Archives Canada.